The fall semester starts August 16, make sure you’re ready. Register for your classes today! 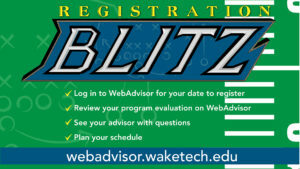 Find you registration time & date on WebAdvisor. For more information email Christie Richards. Want to transfer to NC State? Have questions? 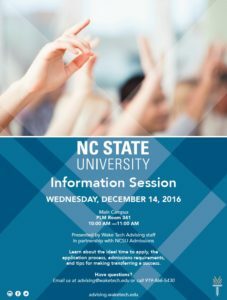 Join us for a NC State Information Session on Wednesday, December 14 from 10:00 – 11:00a.m. on Main Campus in PLM 341. 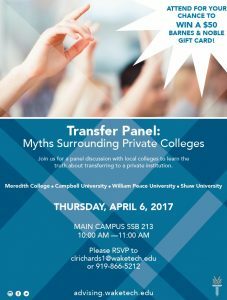 Wake Tech is proud to offer students a convenient new tool for budgeting and managing educational expenses. The college is now offering a tuition payment plan that allows students to pay tuition and fees directly from their checking or savings accounts, or by credit card. Payments can be made in installments, according to when the students enroll. The payment plan is not a loan program. Students incur no debt. No interest or finance charges are assessed, and there is no credit check. The cost for the interest-free monthly payment plan is $25 per semester, a nonrefundable enrollment fee. 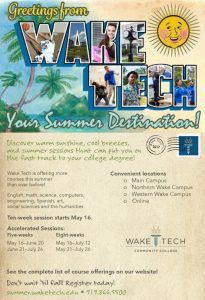 Students must sign-up for Wake Tech’s payment plan by January 4, 2017, to take advantage of it for the spring semester. Wake Tech has partnered with Nelnet, a third-party student loan servicer based in Lincoln, Nebraska, to offer the tuition payment plan. Nelnet specializes in the administration and repayment of student loans and education financial services. 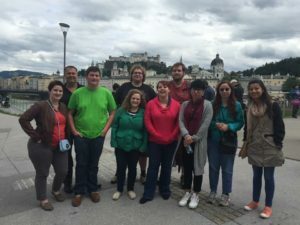 This course surveys music of the Western World. Emphasis is placed on the elements of music, terminology, composers, form, and style within a historical perspective. Upon completion, students should be able to demonstrate skills in basic listening and understanding of the art of music. 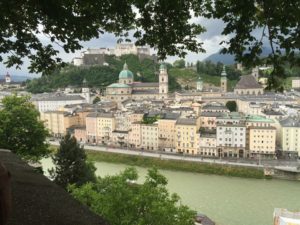 Special attention will be paid to the works of Mozart, Haydn, Beethoven, and Schubert, as befits their geographic and historical importance to Salzburg and/or Vienna. Plan, Register, and Pay with the new PLAN & REGISTER tool in Self Service! Register for courses you need. Your financial aid information is available in MY FINANCIAL AID. Check MY STUDENT ACCOUNT to see your tuition statement, and pay for your tuition. 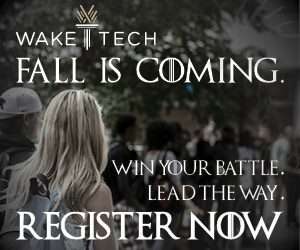 Spring 2017 registration opens October 31! Check WebAdvisor for your exact time and date to register. Are you transferring to a 4-year school? 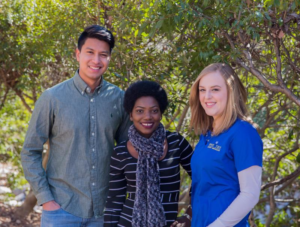 Wake Tech’s First Year Academy (FYA) is dedicated to promoting student success by teaching strategies that help students achieve their educational goals. The e-newsletter will contain “fun facts” by our dedicated faculty as well as submissions from students. Need a reading strategy? Try this one from a fellow student who used it in medical school. We all recognize the natural tendency for our minds to drift as we read dense, academic material. Our attention and input for our brain can’t be sustained for very long, but you can grow this ability easily! The process is simple. Begin working, reading, or studying your notes. The moment you begin to read or acquire whatever knowledge it is that you’re using, start your timer. When you notice your attention waning or shifting, stop studying, note the time you sustained your attention and do something enjoyable for 5 to 10 minutes. Now, resume studying and wait until you realize you’re losing your focus. As you continue to do this wave form study technique, you’re time and focus will increase in both effectiveness and intensity rapidly. It is my hope that by teaching this wonderful method, that perfectly complements how the brain absorbs and stores knowledge, I may be able to help my fellow students to succeed. Newly enrolled Health Sciences students in Human Services Technology and Health and Fitness Science. Please note: All other Health Sciences students must see an advisor at the Perry Health Sciences Campus, 2901 Holston Lane, Raleigh, NC 27610. To schedule an appointment at the Northern Wake Campus or the Main Campus today!